Oral and dental health is part of the health of the body which cannot be separated from one another because it will affect the overall health of the body. Teeth are one part of the body that functions to chew, speak, and maintain the shape of the face, so it is important to maintain dental health as early as possible so that the teeth can last long in the oral cavity. Caries is one of the biggest problems faced by people in Indonesia and other developing countries because of its high prevalence with significant social impacts. In 2010, the WHO has targeted the decay, missing, filled-teeth index (DMFT) index to be 1.0, while in developing countries, the caries index is 1.2. Some indicators that have been determined by the WHO, among others, for children aged 5 years, they should be 90% caries-free, 12-year-old children have a DMFT index of 1, 18-year-old population has no teeth removed (M = 0), and residents aged 35–44 years has a minimum of 20 teeth which function at least 90%. The results of the 2013 Basic Health Research (RISKESDAS) showed that the caries prevalence of the population in Indonesia was 72.6%, population that needs dental and oral care and has been treated was 31.1%, and the tendency of the DMFT index was 4.5. The 2013 RISKESDAS data also showed that DMFT in 12-year-olds was 1.38, while WHO expected Global Goals for Oral Health 2020, DMFT targets in 12-year-old students <1. The high prevalence of dental caries and unsuccessful attempts to overcome it are influenced by several factors, including population distribution factors, environmental factors, behavioral factors, and different dental health factors in Indonesian dental caries. Dental caries can trouble the human body from toddlers to adults. In case of caries experienced by children, especially in primary school age, its tooth structure, including the type of teeth mixed between deciduous and permanent teeth, makes them susceptible to dental caries. Dental caries will cause pain, discomfort, and difficulty in sleeping at night and this can cause children not to attend school. Children who experience caries do not always feel pain, but it can be seen from changes in children's eating and sleeping habits. The primary effect of caries is pain due to an infection, but caries also has an effect on the general health of children, one of which can occur abnormality of body weight due to the development of growth disorders. The correlation between body weight and tooth decay is a controversial issue in various countries. Intake of high-carbohydrate foods is one of the risk factors for overweight, obesity, and caries. Based on research in Central Java conducted by Rosdiana in 2015 in children aged 7–8 years, he showed that children with thinner categories had the most moderate caries status compared to normal and obese children. According to Setiawan, the process of munching food requires certain strength or chewability according to the shape and type of food. A person with poor masticatory will choose food according to the strength of the chewing. Thus, children who experience dental caries cannot consume a variety of foods. It was supported by research conducted by Benzian et al. The survey results showed a significant relationship between caries and body mass index (BMI), especially the relationship between dental infection and BMI below normal. BMI is a simple tool for assessing nutritional status, especially those related to deficiency and overweight. BMI is calculated based on the formula of body weight in kilograms (kg) divided by the height in meters squared. BMI is used widely throughout the world because it is easy, inexpensive, and practical to use. BMI has become a standard in the medical world to define obesity. Keputih Health Center is located in Sukolilo sub-district and consists of two sub-districts, namely Keputih Village and Medokan Semampir Village. Based on a preliminary survey conducted by researchers on 200 children in Elementary School, the average caries prevalence was 89.5%, and the subjects had a DMFT score of 5.42 with an abnormal BMI value caries in students of 73.6%. However, 26.4% of students had normal BMI values. The results of the preliminary research analysis that had been carried out implied that the high degree of DMFT can affect the abnormality of BMI. Based on what has been described above, researchers were interested in researching the profile between BMI and caries status of primary school-age children in the working area of Keputih Health Center, Surabaya. This was descriptive observational study with cross-sectional approach, conducted at national elementary school in Keputih Health Center. Ethical approval for performing this study has been obtained from Research Ethics Committee of Faculty of Dentistry, Universitas Airlangga, with the number of ethic clearance, is 195/KKEPK. FKG/XII/2012. This research is approved by the Head of Public Health Center in area Keputih and running with Head of Town approval. The population in this study was all students attending elementary schools in the working area of Keputih Health Center with a total sample of 120 students. Before the examination and filling out the questionnaire, the licensing process was carried out to the school. The questionnaire previously had gone through the selection process by community dental health experts in the Department of Dental Public Health, Faculty of Dentistry, Universitas Airlangga; then, validity and reliability testing were conducted. The subjects were randomized in a simple random sampling technique. The research subjects answered interview questions on the WHO children's questionnaire form related to caries risk factors and questionnaire forms related to BMI supporting factors. The measurement of body weight (kg) and height (cm) of research subjects was performed then the researchers observed the condition of the oral cavity, which was the number of caries according to the WHO form using WHO probes; then, the distribution of questionnaire forms for the subject mother was started, and it was collected the next day. Data processing had been carried out, and then the results of data analysis in the form of research reports were compiled. The severity of caries was measured using the DMFT index to observe whether or not an index was used to show the number of subjects affected by caries, the number of teeth that needed treatment, and the number of teeth that had been treated. The measurement results showed a score of 0.0–1.1 for very low DMFT, score of 1.2–2.6 for low DMFT, score of 2.7–4.4 for moderate DMFT, score of 4.5–6.5 for high DMFT, and score of >6.6 for very high DMFT. BMI measurements are used to evaluate overweight and obesity based on two parameters, namely height and weight in which weight is measured in kg and height in meters. The WHO classifies BMI values universally through several cut points classified as body weight: <18.5 as skinny, 18.5–<25.0 as normal, and ≥25.0 as overweight. In the study at schools in the working area of Keputih Health Center, DMFT was obtained from 0 to 15 with median of 5. Caries severity was divided into two score categories: >5, indicating poor DMFT and ≤5, indicating good DMFT. Based on [Table 1], caries severity can be related to several risk factors, such as age, experience of dental pain in the past year, frequency of cariogenic food and drinks, independent assessment of subjects on dental and oral health, frequency of subjects' brushing teeth activity in a day, psychic disorders and physical disturbances caused dental and oral health problems, dental visits in the past 1 year, and maternal handling behavior on subjects' toothache problems. Based on age, groups of subjects aged 6–8 years had higher caries severity. Based on the experience of toothache, a group of subjects who had felt toothache had lower caries severity. Based on the cariogenic foods commonly eaten, the groups of subjects who ate cariogenic foods in their daily lives had higher caries severity. Based on the usual cariogenic drinks consumed, the group of subjects who drank cariogenic drinks daily had higher caries severity. Based on a person's independent assessment of dental and oral health, the group of subjects who felt that they had good dental and gum conditions had higher caries severity. Based on the frequency of tooth brushing, the group of subjects who brushed their teeth twice or more daily had lower caries severity. Based on psychic disorders due to dental and oral health disorders, the group of subjects who felt there was a disorder had higher caries severity. Based on physical disorders due to dental and oral health problems, the group of subjects who felt that there was a disorder had higher caries severity. Based on dental visits, the group of subjects who had been to the dentist for the past 12 months had higher caries severity. Based on the mothers' handling behavior on child toothache problems, the group of subjects who had good behavior had higher caries severity. An abnormal BMI in children was regrouped based on thin and fat bodies. From[Table 2], it can be seen that children with a DMFT score of >5 tended to have a thin BMI with a frequency of 88 children and a percentage of 76.5%. 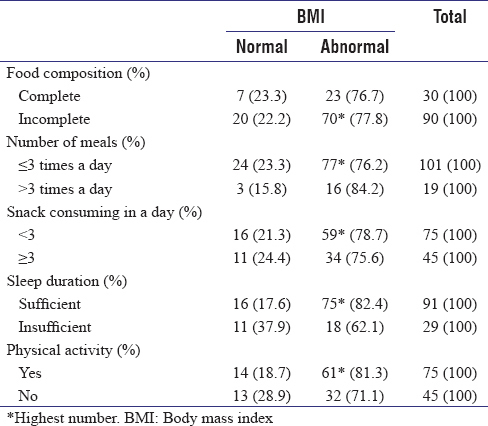 From [Table 3], it an be seen that based on the composition of food, the group of subjects who had abnormal BMI was 93 children with a percentage of 77.8%. Based on the number of meals, the results showed a large amount of food <3 times in 1 day and had abnormal weight in 16 children with a percentage of 84.2%. Based on snacks, it was found that children who had a frequency of eating snacks <3 times a day with abnormal BMI had the highest frequency of 59, with a percentage of 78.7%. Based on the duration of sleep, the results of the study subjects found that children with adequate sleep duration in 1 day but had abnormal BMI values were 75 people with a percentage of 82.4%. Based on physical activity, the results of the research found that children who did physical activity outside of sports hours but had abnormal BMI values were 61 people with a percentage of 81.3%. 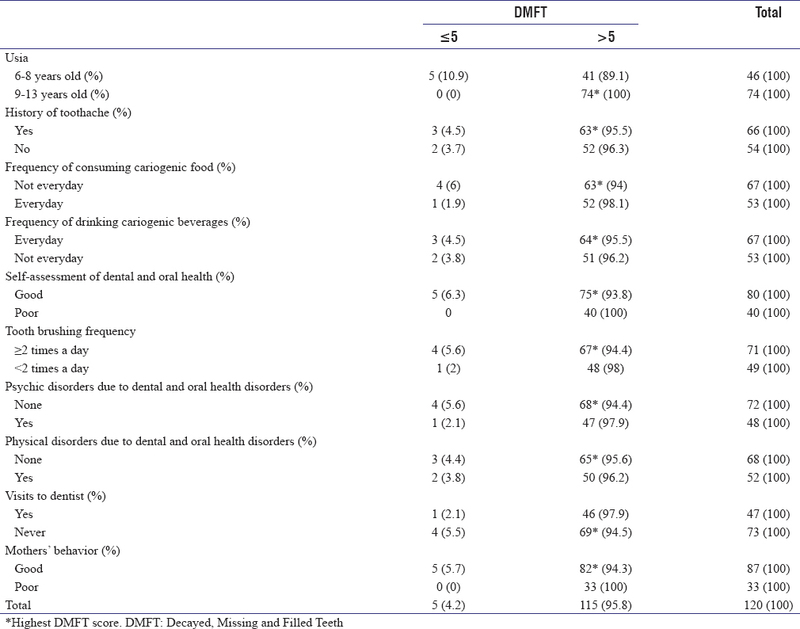 Based on [Table 4], it can be seen that children with DMFT values of >5 and actively doing physical activity tended to have a Body Mass Index (BMI) with thin categories, which are 52 children with a percentage of 89.6%. Sixty-five children with DMFT values of >5 and having frequency of large meals >3 times a day tended to have thin mass index body with percentage of 89.1. Forty-nine children with DMFT values of >5 and had frequency of eating snacks less than three times a day tended to have a BMI in the thin category with a percentage of 89.1%. Nineteen children with DMFT values of >5 and who had complete food composition tended to have a mass index body with a thin category with a percentage of 90.4%. Seventeen children with DMFT values of >5 and who had insufficient sleep duration tended to have a mass index body with a thin category with a percentage of 94.4%. In this study, the assessment of caries severity in public elementary school students in the Keputih Health Center working area was done using DMFT/deft measuring instrument, which is an index of measurement of damaged dental caries (cavities). The severity of caries can be affected by several associated risk factors. The number of research subjects was 120 students of SDN Medokan Semampir and SDN Keputih. The data obtained in the study were that the DMFT score was 5 and the median was 5 with 89.5% of children having caries. Children aged 6–8 years had higher caries severity than the 9–13 years age group. In cross tabulation, P < 0.05 indicates that there was significant result between age and severity of caries. In the 6–8 years of age group, 41 children had DMFT score of >5. This was consistent with the theory which states that the older the children, they will have better knowledge in maintaining the cleanliness of their teeth and mouth. Children's knowledge about dental health is still lacking compared to adults that affects them in cleaning their teeth, while food that causes dental caries the ones that contain sugar attached to the tooth surface. Meanwhile, sweet food is a child's favorite. Children have the highest caries risk when their teeth have just erupted (age range of elementary school children). The eruption time of permanent first molars is faster than that of other molars, causing these teeth to be susceptible to caries because at this time the occlusal surface of the first molars is developing. The anatomical form of the first permanent molars is more pit and fissure than the other teeth so that the tooth is more at risk of caries at most. In this study, a high caries severity rate of 96.3% had no experience of dental pain with significance test results of P > 0.05 with an odds ratio of 1.238. Previous caries experience is a strong indicator to determine the occurrence of caries in the future. Children who have caries in primary teeth tend to be three times more likely to have caries in the permanent teeth. However, not all direct caries can be felt. At the age of 4–8 years in primary teeth and aged 12–13 years in permanent teeth, superficial caries can be experienced which is a pathological process in the form of limited damage to the dental tissue, starting from an e-mail which can then proceed to dentin. When caries occurs only on the surface of the enamel, it still does not hurt. There is only black or brown staining on the e-mail. When caries has reached dentin and the pulp chamber, there will be pain. The DMFT index can only determine the presence or absence of caries but cannot determine to what extent caries can occur. Dental caries occurs in many children because children tend to prefer sweet foods and drinks that can cause dental caries. The group of elementary school children is a group that is susceptible to dental and oral diseases because they have self-habits that do not support dental health. This is because the child's knowledge of the importance of maintaining dental and oral health is still lacking. Children generally love sweets. If children eat too much and eat sugar too often and rarely clean it, then the teeth may experience caries. There were no significant results between the severity of caries in the study subjects and the frequency of consumption of cariogenic foods and beverages. This is very likely to occur because caries is a multifactorial disease, meaning that many factors can cause caries. A study conducted by Ramayani and Nadhiroh (2012) stated that children with good habits are the children who will immediately drink water after consuming cariogenic foods and drinks. This is very effective for caries prevention because it will reduce the attachment of foods containing sugar on the tooth surface. From the results of caries severity study of elementary school students in the work area of Keputih Health Center, it was found that the frequency of cariogenic food consuming when cross-tabulated with DMFT showed high caries severity in students with daily frequency of cariogenic food consuming as much as 98.1% with P > 0.05 and odds ratio of 3.302 This was consistent with a research which stated that elementary school children tend to like to consume cariogenic food, such as chocolate, candy, cotton candy, and biscuit, because cariogenic food is more enjoyable eaten by elementary students without knowing the impact caused by food if ignoring dental and oral hygiene. The higher the amount of consumption of cariogenic food, it will affect the state of dental health in primary schoolchildren. Based on research with independent assessment of good oral and dental health, 75 children had DMFT score >5 with a percentage of 93.8%. These results indicated that students' knowledge was very important in underlying the formation of behaviors that support the cleanliness of teeth and mouth. Maintaining dental and oral hygiene at school age is one way to improve health at an early age of 19. Knowledge is very important in shaping a person's actions. From experience and research, it is proven that behavior based on knowledge will be more lasting than behavior that is not based on knowledge. Dental and oral health behaviors are related to children's lifestyle in maintaining the health of their teeth and mouth. This is related to the frequency of brushing teeth, proper time to brush teeth, method of brushing teeth, habit of cleaning tongue, use of dental floss, frequency of consuming sweet foods and drinks, and visiting a dentist. The results of the study showed that children with independent assessment of dental and oral health both showed no significant differences in caries severity which can be seen from the value >0.05, which was equal to 0.106. These results were not found to have significant differences because there were other factors that could affect the severity of caries. Besides, it was also not in accordance with the theory because students feel that their teeth were in a normal state since there were no complaints that arise and they assumed that cavities were not important. The frequency of subjects brushing their teeth in a day when cross-tabulated with DMFT showed high caries severity in students with tooth brushing frequency less than twice a day as much as 98% with a significance test of P > 0.05 with an odds ratio of 2.866. This was consistent with research conducted by Tince in 2010 which stated that people who brush their teeth at least twice a day using toothpaste have a lower caries status compared to people who rarely brush their teeth. The proper time for brushing teeth is after breakfast and before going to bed, because at night, the flow of saliva and mouth movements are reduced, causing the power to clean the teeth of debris also decreases and makes the germs in the mouth develop twice as fast as during the day. Physical disturbances, such as mastication and tooth pain, can make children absent from school when cross-tabulated with DMFT. The results showed that high caries severity with mastication and not attending school was due to 96.2% toothache with a significance test of P > 0.05 with an odds ratio of 1.154. This was in accordance with the theory which stated that dental caries can cause disruption of the function of mastication and toothache will affect nutritional status through the mechanism of disruption of the masticatory function. Dental caries that occurs in children will cause pain so that the children will become lazy to eat in which this can affect the BMI. Based on the odds ratio, it is illustrated that children who have physical impairments due to dental and oral health problems are at risk of 1.1 times of caries. Psychic disorders, such as embarrassment with the condition of children's teeth when cross-tabulated with DMFT found a high caries severity, had a psychic disorder which caused a feeling of shame with his teeth as much as 97.9% with a significance test of P > 0.05 with an odds ratio of 2.765. This was consistent with the theory that the quality of life related to oral health is an indicator that assesses the oral health conditions of a person's quality of life and its effects on daily life. The relationship obtained was in the form of a negative relationship. The deeper someone's caries, the lower the quality of life associated with oral health. The deeper the caries suffered by a person, the lower the quality of life he has. Oral health in children will affect the growth of teeth and jaw, speech function, esthetics, acute infection, sleep disturbances, and severe caries at risk of taking longer rest. From this study, it can be proved that in groups with higher number of dental caries experience (DMFT >5) also had high psychic disorder of 97.9%. The frequency of visits to dentists shows the frequency of exposure of a community to promotive, preventive, curative, and rehabilitative health efforts. Thus, that it can be assumed that people who have visited a dentist receive information about dental and oral health better than those who have never been to a dentist. The implementation can be seen in dental and oral health which is assessed based on the severity of a person's caries. The results regarding behavior of subjects to visit the dentist in this study showed P > 0.05, which was equal to 0.370 and interpreted as an insignificant factor in determining the severity of caries in the Keputih Health Center area. A visit to the dentist is affected by the ease of access to reach health care facilities. One factor that supports the ease of obtaining dental and oral health services is access to short distance and time. Factors of ease of access to health care facilities are enabling factors, not the main factors that can determine the severity of caries in an individual. Maternal handling behavior towards dental problems in this study showed P higher than 0.05, which was equal to 0.159 and interpreted as a factor that was not significant in determining the severity of caries. This is not in accordance with the theory which stated that parental knowledge is very important in underpinning the formation of behaviors that support or not support children's oral hygiene. In addition, according to Erika, the first figure known to a child as soon as he was born was her mother. Therefore, the behavior and habits of the mother can be emulated by the child. This can happen because the behavior of parents is not the only factor that determines the health of a child's teeth and mouth, there are many other factors. Behavioral factors, according to the magnitude of influence on health status occupy the second influence after environmental factors. Thus, behavior is not the most powerful factor in determining the severity of caries. The severity of dental caries in elementary school children in the working area of Keputih Health Center did not have a significant difference to the BMI which can be seen from the P value higher than 0.05 which was 0.218 but also found that children with DMFT values were more out of five tended to have an abnormal BMI. These results were consistent with the theory that children with dental caries had less weight. This is because dental caries can cause pain so that children tend to avoid hard foods and main foods; this condition can cause weight loss and nutritional deficiencies. The absence of a significant difference between caries severity and BMI is possible due to other factors that affect the mass index body such as eating habits and duration of sleep in a day and physical activity outside of school. The frequency of consuming snacks in 1 day did not have a significant difference to the BMI which can be seen from the P > 0.05, which was equal to 0.693. This result was in line with a research which showed that there was no correlation between the frequency of consumption of fast food with nutritional status. Children who had frequency of eating snacks less than three times a day but having a thin body can be influenced by the type of snack. Most types of snacks that children often eat are snacks that are part of unhealthy food and lack of nutrients. Children who had frequency of eating snacks less than three times a day and had fat body at the same time were possible because children tended to eat the main or large foods more often than snacks, so the calories obtained from large meals were very influential on the children's weight. There were 93 children with large food composition in 1 day which were incomplete and those with abnormal weight with a percentage of 77.8%, P = 0.9, which showed that there was no significant difference between the composition of large food in 1 day which was incomplete with BMI. These results were in accordance with the theory, but there were no significant differences due to other factors that can affect the BMI, namely eating habits in 1 day, physical activity, and total sleep duration. The composition of food eaten by children every day can affect a child's weight if the composition of foods that are eaten excessively or less can cause weight to be abnormal (obesity and underweight). Multifactor that contributes to the occurrence of obesity is the factor of food intake (macronutrients, fiber intake, breakfast intake, fast food consumption patterns, consumption patterns of sweet foods/drinks); physical activity factors; psychological factors (self-esteem); and genetic factors. Obesity includes intake of a high-fat diet, excessive consumption of energy-dense foods, and based on recent research, a diet characterized by greater carbohydrate content, high consumption of foods with a glycemic index compared to low glycemic index foods. There were 16 children with large amounts of food <3 times in 1 day and having abnormal weight with a percentage of 84.2%, P = 0.445, which showed no significant difference between the number of large meals <3 times in 1 day with BMI. This was consistent with the theory which states that to obtain sufficient energy, everyone should pay attention to their diet by getting used to eating three times a day, morning, afternoon, and evening, regularly. Especially, the habit of eating breakfast is very important because our activities during the day need a lot of energy. This diet, if not rationally consumed, easily causes excess calorie intake which will lead to overweight or obesity. The size or portion of the meal that is too excessive can also have many calories in large quantities compared to what is recommended for normal people for their daily consumption. Based on research on eating behavior in obese students, it was concluded that the main eating behavior of 86% obese students was >3 times a day and had a habit of adding portions of food at mealtime, a favorite food was high in calories and low in fiber. Desiana's study also concluded that in addition to the main foods, obese children have snack habits. The level of sleep duration in 1 day had a significant difference to the BMI with a P < 0.05 that was equal to 0.024 and the results of the study subjects were obtained that children with enough sleep duration in 1 day but had abnormal BMI values were as many as 75 people with a percentage of 82.4%. These results were consistent with research who said that there was a significant relationship between sleep duration and BMI, which showed that lack of sleep duration with high-energy intake did not affect the abnormal BMI value, but sleep duration enough with high-energy intake will have an effect on an abnormal BMI value of 3.3 times. However, a research stated that the factors that cause children with sufficient sleep duration in 1 day but have an abnormal BMI value was that there was a disturbance during sleep. Sixty-one children did physical activity outside sports hours but had an abnormal BMI value with a percentage of 81.3%, P = 0.142, which showed no significant difference between physical activity outside sports hours and BMI. These results were consistent with the study that there was no significant relationship between physical activity and BMI. Meanwhile, according to Koko, lack of physical activity causes a lot of energy stored as fat so that people who do less activity tend to be fat. This explains that the level of physical activity contributes to the incidence of excess body weight, especially the habit of sitting continuously, watching television, using computers and other high-tech tools. Physical activity is a risk factor for the occurrence of overweight that children who have mild physical activity have a significant relationship with excess body weight. However, the research results obtained were not in accordance with the theory because the duration, frequency, and type of activity were not measured. Based on the cross-tabulation table of BMI with DMFT and risk factors related to BMI, three table [Table 2], [Table 3] and [Table 4] showed that all subjects who had high DMFT were children who had BMIs in thin category. This was in accordance with the theory that the lack of protein consumption of children with high caries severity is very likely related to the chewing ability of children who experience caries because the part of the tooth that functions to cut and grind food has been reduced so that it reduces the ability of occlusion. Caries that are not treated will continue into the dental pulp where dental infections will cause the release of cytokines which can affect growth. In the five tables, it can be seen that both high- and low-risk factors showed no significant difference in BMI; therefore, the problem was the severity of caries. We would like to acknowledge the Department of Dental Public Health, Faculty of Dentistry, Universitas Airlangga. Ibiyemi O, Taiwo JO. Psychosocial aspect of anterior tooth discoloration among adolescents in Igbo-Ora, Southwestern Nigeria. Ann Ib Postgrad Med 2011;9:94-9. Dharmalaksana D, Rahaswanti A, Ani LS. The Description of the incidence of dental caries based on the body mass index in children aged 48-60 months in Pembina Negeri Denpasar Kindergarten. Program Studi Pendidikan Dokter Gigi Fakultas Kedokteran Universitas Udayana. Bali Dent J 2017;1:19. Goodwin M, Patel DK, Vyas A, Khan AJ, McGrady MG, Boothman N, et al. Sugar before bed: A simple dietary risk factor for caries experience. Community Dent Health 2017;34:8-13. Garbin CA, Soares GB, Docusse FR, Garbin AJ, Arcieri RM. Oral health education in school: Parents attitude and prevalence of caries in children. Rev Odontol UNESP 2015;44:285. Bafti LS, Hashemipour MA, Poureslami H, Hoseinian Z. Relationship between body mass index and tooth decay in a population of 3-6-year-old children in Iran. Int J Dent 2015;2015:126530. Rosdiana WD. Effect of Consumption of Kariogenic Foods And Nutritional Status Against Caries Status Students of Ngadirejo State Elementary School I Aged 7-8 Years, Kartasura District, Sukoharjo Regency. Diss. Universitas Muhammadiyah Surakarta; 2015. Setiawan B. Effect of artificially posterior angle of tooth protrusion on changes in food particles. Yogyakarta: UGM; 2003. Benzian H, Monse B, Heinrich-Weltzien R, Hobdell M, Mulder J, van Palenstein Helderman W, et al. Untreated severe dental decay: A neglected determinant of low body mass index in 12-year-old Filipino children. BMC Public Health 2011;11:558. Soetjiningsih R, Gde IG. Tumbuh Kembang Anak. Jakarta: EGC; 2012. Schlenker E. Essentials of Nutrition and Diet Therapy. Louis, Missouri: Elsevier Health Sciences; 2014. Gerritsen S. Nutrition education for early childhood managers, teachers and nursery cooks: A prerequisite for effective obesity prevention. Public Health 2016;140:56-8. Stein C, Santos NML, Hilgert JB, Hugo FN. Effectiveness of oral health education on oral hygiene and dental caries in schoolchildren: Systematic review and meta-analysis. Community Dent Oral Epidemiol 2018;46:30-7. Carson V, Lee EY, Hewitt L, Jennings C, Hunter S, Kuzik N, et al. Systematic review of the relationships between physical activity and health indicators in the early years (0-4 years). BMC Public Health 2017;17:854. Britto PR, Lye SJ, Proulx K, Yousafzai AK, Matthews SG, Vaivada T, et al. Nurturing care: Promoting early childhood development. Lancet 2017;389:91-102. Harlina. Dental and Oral Health. Bandung: PT Remaja Rosdakarya; 2011. Ramayani MP, Nadhiroh SR. Relationship between dental caries and the level of consumption and nutritional status of primary school age children. Med Gizi Indonesia 2012;2:1492. Winarno W. The Chemistry of Food and Nutrition. Jakarta: PT. Gramedia Pustaka; 2004. p. 17. Alejandra NM, Paula CM, Patricia AM. Study of nutrition habits in primary school students. J Clin Nutr Diet 2016;2:4. Sharda J, Mathur LK, Sharda AJ. Oral health behavior and its relationship with dental caries status and periodontal status among 12-13 year old school children in Udaipur, India. Oral Health Dent Manag 2013;12:237-42. Kidd E, Fejerskov O. Essentials of Dental Caries. New York: Oxford University Press; 2016. Aragao AS, Fernandes LH, Brandt LM, Auad SM, Cavalcanti AL. Association between nutritional status and dental caries in Brazilian teenagers with and without risk for eating disorders. Pesqui Bras Odontopediatria Clin Integr 2016;16:479-89. Chukwumah NM, Folayan MO, Oziegbe EO, Umweni AA. Impact of dental caries and its treatment on the quality of life of 12- to 15-year-old adolescents in Benin, Nigeria. Int J Paediatr Dent 2016;26:66-76. Glick M, Williams DM, Kleinman DV, Vujicic M, Watt RG, Weyant RJ, et al. Anew definition for oral health developed by the FDI world dental federation opens the door to a universal definition of oral health. J Am Dent Assoc 2016;147:915-7. Martins LG, Pereira CR, Costa SX, Traebert E, Lunardelli SE, Lunardelli AN, et al. Impact of dental caries on quality of life of school children. Pesqui Bras Odontopediatria Clin Integr 2016;16:307-12. Riba H, Al-Zahrani S, Al-Buqmi N, Al-Jundi A. A review of behavior evaluation scales in pediatric dentistry and suggested modification to the Frankl scale. EC Dent Sci 2017;16:269-75. Dewi IG, Seriani L. Overview of nutritional status, breakfast consumption, and snacks for public elementary school students in Gianyar Regency, Bali. 2014. Fakultas Kedoktearn Universitas Udayana; 2014. p. 8. Waweru WR, Marete OT. Estimation of relationship between eating habits and body mass index of students in Mount Kenya University, Rwanda. Int J Community Med Public Health 2016;3:2344-54. Proverawati A, Prawirohartono EP, Kuntjoro T. Child's gender, mother's education, and motivation from the teacher and its relationship with school children's food preferences for preschoolers in Muhammadiyah University Purwokerto Kindergarten. J Gizi Klinik Indonesia 2008;5:78-83. Riswandi MA, Adhani R, Hayatie L. The difference in dental caries index between students with more nutritional status and normal nutritional status. Dent J Kedokteran Gigi 2016;1:135-9. Ramadaniah. Sleep duration, energy intake, and physical activity with the incidence of obesity in health center's workers. Jurnal Gizi Klinik Indonesia 2014;11:85-96. Amelia N. Description of sleep disorders and their relationship to the height of children aged 9-12 years. Jakarta: UIN; 2015. Mahmoud MH, Taha AS. The association between eating habits and body mass index among nursing students. IOSR J Nurs Health Sci 2017;6:14-26. Koko. Relationship between physical activity and diet with changes in body mass index in 2nd semester students in medical science nursing study programs. Ejournal Keperawatan 2016;4:4. Brandt LM, Fernandes LH, Aragão AS, Aguiar YP, Auad SM, de Castro RD, et al. Relationship between risk behavior for eating disorders and dental caries and dental erosion. Scientific World Journal 2017;2017:1656417. Al-Mikhlafi AM, Al-Labani MA, Al-Haddad KA, Al-Serouri AA, AlGhazali N. The prevalence of dental caries in kindergartens' and its associated factors among children in Sana'a city. EC Dent Sci 2017;7:206-11.